After reminding us of all the new features of watchOS 3, Apple wasted no time and introduced the second generation Apple Watch! Called the Apple Watch Series 2, the new gizmo looks very much like the old generation, and it'd be pretty hard to discern the two from afar. But rest assured that the Apple Watch Series 2 does bring a bunch of upgrades — enough to make it hard for newcomers to choose a cheaper 1st generation unit over a shiny new one. We're still not sure if the new features are enough to entice one to upgrade, though, but we do assume that the more avid runners out there would prefer to have that GPS functionality. So, what are the new features of the Apple Watch Series 2? Check the slideshow below to get the full scoop! At last! Sure, the original Watch was splash-resistant, but the Apple Watch Series 2 goes overkill with certified resistance to water when submerged up to 50 meters! Apple even put it through some very rigorous testing to ensure that even daily swims wouldn't be able to get to the Watch Series 2. The second generation System-in-Case, which Apple uses in the Watch Series 2, has a new dual-core processor, which is 50% faster than its predecessor, and a GPU, which is twice as fast as the old one. 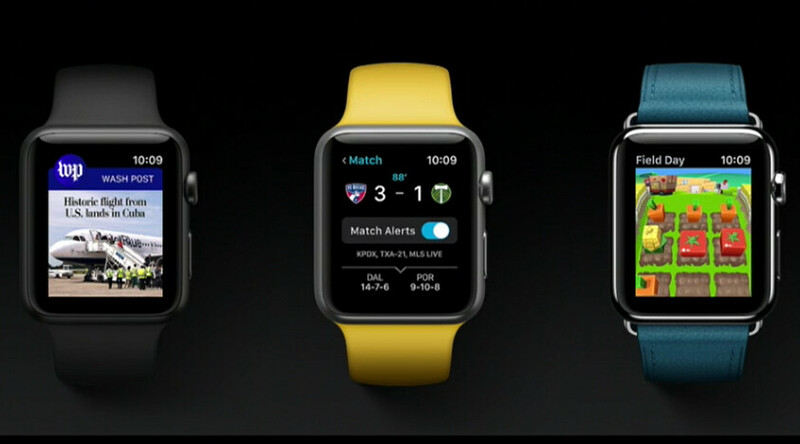 As a result, Apple says, the Watch 2 is snappier, more fluid, and more responsive. It even said that intensive apps, such as Night Sky 4 (stargazing app), easily reach 60 frames per second. Having a built-in GPS in your fitness tracker means you don't need to bring your phone along for runs. The Apple Watch Series 2 can record your jogging routes and speeds autonomously. The choice of bodies has been expanded even further with the choice of classy, classy ceramic! The body is touted to be 4 times harder than stainless steel, and we expect it to have the price to match. The old generation Apple Watch isn't done and over! It will be upgraded with the same new dual-core processor and will now sell as a cheaper version, called Apple Watch Series 1. Watch series 2 all new features : GPS.....shortest article ever. Could have just put it in the headline and gone home early. Of course it would double the revenue. Articles of substance would actually bring in consistent and positively engaged readers. They can't made up their own features and write it there though. Well there are ways to pad it properly but I was just replying in general, not specifically to this one. The Number 5,6 and 7 are not features, though. That's great, Apple. Solid upgrades in the new gizmo! The number 5,6, and 7 are not even features. but different models. Same hideous design, Pass! I would've liked a good looking one for my 6S plus but that design? Nope! Yep. And no mention of battery life.